When breaking down the Patriots’ moves to get down to their final 53-man roster — which is likely still a fluid situation — the more and more one digests the roster fluctuation, the more one can determine the root causes of certain actions. For the team’s brass, a lot of decisions appear to be traced back to the health and availability of tight end Rob Gronkowski. After missing the entire offseason while rehabilitating from back and forearm surgery, Gronkowski returned to practice Sunday in full pads, going through drills. With Gronkowski at his disposal, Bill Belichick was able to release veteran tight ends Jake Ballard and Daniel Fells without remorse. 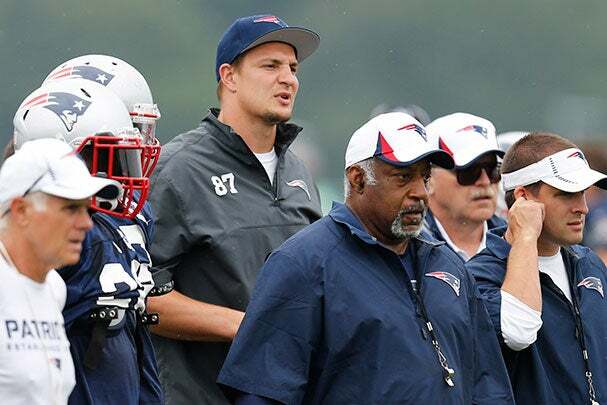 While the timeline for Gronk’s recovery has him ready to play by Week 2 or 3 of the season, it appears the team is much more comfortable about when he’ll return than initially expected, giving credence to the view that the initial timeline reported was skewed toward precaution. That precaution now appears tossed aside. Gronkowski’s return not only affects the tight ends group but it alters how the team views its H-backs, Michael Hoomanwanui and James Develin, which in turn affects how the team views its running backs group. Leon Washington’s job didn’t survive the weekend, mostly because Develin provided more value than Ballard, Fells or Washington could on offense and special teams. If Gronkowski couldn’t play, any one of those players could still be playing for the Patriots. Those three players can contribute to any number of NFL teams right now. The same can be said for punter Zoltan Mesko, who was released Saturday. Mesko’s release, on the other hand, has nothing to do with Gronkowski. He lost his job to rookie punter Ryan Allen, a two-time Ray Guy award winner from Louisiana Tech. Mesko was slated to earn $1.323 million this season. Allen will earn the rookie minimum, $405,000. You do the math. Finally, in the team’s most noted roster move, the Patriots cut popular third-string quarterback Tim Tebow. Tebow’s release means a couple of things for the offense and a certain subset of plays, including the wildcat and read option. The team can either ignore the trend entirely, as has been custom, or turn to other players on the roster with the skillset to play that role. While Tebow appeared to run those plays exclusively during the preseason, he is not the only player that can handle those packages. Julian Edelman has yet to show off his quarterback roots from Kent State. After the cuts and an entire preseason to evaluate the Patriots’ roster, this depth chart tries to identify the role of each player on the team. Of course, this doesn’t take into account select plays set aside for certain players. For instance, Shane Vereen’s flexibility allows for him to do things outside his role as the team’s third down running back. And in the wide receiver’s group, a player like Josh Boyce, who is further down the depth chart, will likely contribute more on the offense in certain situations. The same can be said for linebacker Jamie Collins as well as cornerbacks Logan Ryan and Marquice Cole, who will likely see a lot of action in passing situations. I really wish they would have tried [Tim Tebow] in the TE position, it seems like he would excel there. I’m not shocked about the releasing him as a QB, but I am surprised they didn’t try to use him elsewhere. I would like him to still be a Patriot. Mesko you could see coming. He had a rough year last year, and this new kid looks incredible. When you look at the cost differential, it’s a no-brainer. A couple of things here, Tebow could never play tight end. Trying him there is not anywhere near the best use of his talents. But more so, he wouldn’t have been able to compete with veteran tight ends on the roster. For Tebow, his release doesn’t change much in regards to the scouting report on him. He’s never had the accuracy or ability to make quick decisions necessary for an offense like the one the Patriots run. But he can play quarterback for a team willing to stray away from being so pocket passer focused, something similar to what can be found in college. But professionally, his options are limited. Second, it’s tough to see Mesko go. Despite the difference in salaries (Mesko was slated to make more than double that of Ryan Allen), he was an excellent locker room presence and was very giving in the community. I’d almost equate him with Matthew Slater, who is well regarded by the team in the same respect. It’s no surprise that they are both the last two Ron Burton community service award winners. It’s very much a surprise that these non-football intangibles he brought to the team couldn’t push him over the edge, especially after this summer. – On Wednesday the Patriots will release their first injury report following practice. – Also on Wednesday, I’ll be publishing for my first weekly installment of NFL picks. We’ll be tracking my progress throughout the season. – On Thursday, the NFL season kicks off with the Baltimore Ravens visiting the Denver Broncos. The game is set for 8:30 p.m. on NBC. – At 1 p.m. Sunday, Sept. 8, the Patriots will open their 2013 regular season at the Buffalo Bills. That’s 6 days from now. Zuri Berry can be reached at zberry@boston.com. Follow him on Twitter @zuriberry.